Chronic suppurative otitis media (CSOM) is one of the common causes of facial palsy and accounts for 3.1% of all cases of facial palsy. Facial palsy in CSOM can be acute or insidious. Further prognosis is varied because of different mechanisms of facial palsy in CSOM. 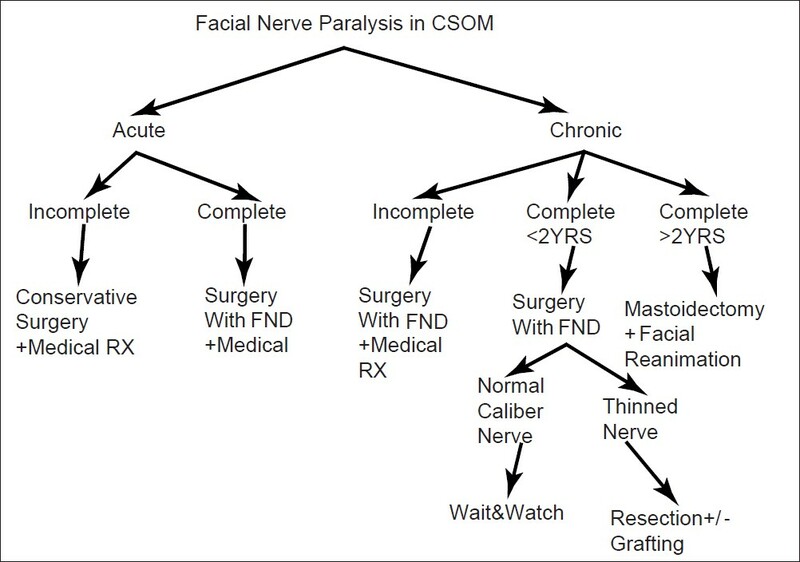 Four cases of facial nerve paralysis secondary to CSOM are presented so as to illustrate the varying surgical situations and their management. A 14-year-old male presented with left CSOM since 6 months and left facial palsy grade 3 since 15 days. Examination indicated a conductive hearing loss (PTA 50/15 B) and granulations in the posterosuperior quadrant with associated bony erosion of the canal wall. HRCT of the temporal bone revealed soft tissue involving the middle ear, mastoid antrum, and EAC with suspicious erosion of the LSCC dome. The patient underwent canal wall down (CWD) mastoidectomy and was found to have granulations involving the middle ear, attic, aditus, and antrum. There were granulations on the dome of the LSCC and the adjacent Fallopian canal More Details. Light palpation on the granulations indicated an underlying LSCC fistula (5 mm Χ 5 mm) and dehiscence of the fallopian canal. The granulations were left undisturbed as it was felt that surgical manipulation may jeopardize inner ear functions. Post-operatively, cochleovestibular function was preserved, and the facial nerve demonstrated steady improvement with return to normal function by the end of the 3 rd week. An 18-year-old male presented with CSOM since 2 years associated with left facial weakness grade 2 since 7 days (PTA- left profound SNHL). The patient underwent CWD mastoidectomy and was found to have postero-superior retraction cholesteatoma involving the facial recess, sinus tympani, attic, aditus, and antrum. The LSCC was blue-lined by the cholesteatoma; the facial canal demonstrated no bony dehiscences. Post-operatively, the facial nerve status improved rapidly and by the 5 th day to grade 1. A 35-year-old female presented with complaints of right ear discharge and hearing loss. She had a polypectomy in the right ear a month ago, and histopathology evaluation of the same had indicated simple granulation tissue. 15 days after the procedure, she developed right facial palsy (sudden onset and complete) with associated increase in pus discharge and right post-aural swelling, which improved partially with conservative treatment by her local practitioner. On presentation to us, a week from the onset of her facial paralysis, she demonstrated right profound SNHL and a postural abscess. The HRCT showed an expansile lytic locally invasive soft tissue opacification of the right mastoid with a promontory cochlear fistula, eroded SCCs, and LSCC fistula. An MRI indicated a large destructive right mastoid mass extending to EAC, ME, extradural MCF, and PCF erosion of labyrinth and vertical facial nerve with doubtful right sigmoid sinus thrombosis. The patient underwent an emergency radical mastoidectomy and intra-operatively was found to have a large cavity filled with cholesteatoma, which was eroding the dural plate and entire sinus plate, the Trautman's triangle and lying in direct contact with the posterior fossa dura. The disease was extending into the perifacial cells and eroding all the three SCCs, with only a small remnant of LSCC. The facial nerve was exposed from the first genu till the stylomastoid foramen with 360-degree exposure of the vertical facial nerve. There was a promontory cochlear fistula. Postoperatively, the patient developed grade 6 facial palsy, and there was breakdown of the postaural wound. 7 months in follow-up, her facial nerve function has recovered to grade 2, and she is planned for mastoid cavity obliteration to prevent any herniation of intracranial contents through the large dehiscence in the sinus plate. Her postoperative CT scans indicate she is otherwise disease-free, with a dry ear. An 18-year-old female presented with complaints of bilateral CSOM since 10 years with bilateral severe impairment of hearing and left facial weakness grade VI since 7 years. She had developed the facial palsy 7 years ago with a left-sided post-aural abscess, which had spontaneously drained leaving a post-aural fistula and complete facial palsy. She underwent a CWD mastoidectomy and found to have cholesteatoma eroding all the 3 SCCs and a promontory cochlear fistula. There were no remnants of the facial nerve, only a soft tissue stump was found in the region of the first genu. Facial nerve repair was obviously inappropriate in this situation and she was, therefore, considered for alternate adynamic/static procedures. The patient's concern was primarily with the drooping of the angle of the mouth, and she had no significant asymmetry of the eye. She, therefore, underwent left malar suspension to pull up the paralyzed oral commisure and bring about symmetry at rest for the lower face. The incidence of facial palsy with OM/CSOM has a wide range as reported by various authors. Pollock and Brown  reported it to be 0.16% (2/1250), Kangsanarak et al. reported it to be 0.29% in 13948 patients with CSOM, and Savic and Djeric  reported it as 5.1% in 1261 patients. The commonest cause of facial palsy is Bell's palsy. The incidence of facial palsy directly related to cholesteatoma in modern literature is around 0.04% to 0.16%. There has been a definite decrease in the incidence of facial palsy due to CSOM, probably due to earlier diagnosis and treatment. The facial nerve fills 35% to 65% of its canal and rest of the canal is filled by connective tissue and blood vessels without any empty space. Facial canal dehiscence (75%) is thought to be a major factor in CSOM causing facial palsy by some authors. It can also be hidden from the surgeon's view e.g. dehiscence of the vestibular surface of the facial canal. Various other factors include osteitis, bone erosion, external compression, edema, and inflammation of the nerve, interruption of the blood supply to the facial nerve, surgical trauma, and collagenase activity of cholesteatoma. On rare occasion, the nerve has been transected by cholesteatoma. Cholesteatoma usually causes slow onset FNP, which accounts for 80% of such cases, whereas acute infections superimposed on CSOM tend to cause an acute FNP. It has been found that FNP does not occur until extrinsic compression results in disruption of>50% nerve fibers. Thus, with an acute mastoiditis (with prior CSOM) and anatomical dehiscence/no dehiscence in facial canal, there might be acute paralysis (complete/incomplete) as in cases 1 and 2. Otherwise, with gradual spread of cholesteatoma and erosion of the facial canal, there might be gradual onset paralysis. In our experience, when there is an incomplete paralysis, especially of acute onset, recovery may be anticipated with surgical removal of disease alone, and a formal facial nerve decompression (FND) may be unnecessary. If paralysis is complete and acute, then FND may help in recovery. When the nerve is dehiscent over a significant length, then only disease clearance may be sufficient. Three cases in this report had acute and incomplete paresis- they had surgical excision of disease in the middle ear and mastoid but did not undergo FND. Nevertheless, recovery was noted in all. Based on the literature and our experience in this report, a surgical scheme for the management of facial nerve paralysis is outlined in [Figure 1]. Patients with complete facial palsy of a few years (as in case 4 in this report) are unlikely to show recovery with FND alone and for them, a facial rehabilitation static or dynamic procedures is more appropriate. 1. Takahashi H, Nakamura H, Yui M, Mori H. Analysis of fifty cases of facial palsy due to otitis media. Arch Otorhinolaryngol 1985;241:163-8. 2. Pollock RA, Brown LA. Facial paralysis in otitis media. In: Graham MD, House WF, editors. Disorders of the Facial Nerve. New York: Raven Press; 1982. p. 221-4. 3. Kangsanarak J, Fooanant S, Ruckphaopunt K, Navacharoen N, Teotrakul S. Extracranial and intracranial complications of suppurative otitis media: Report of 102 cases. J Laryngol Otol 1993;107:999-1004. 4. Savic DL, Djeric DR. Facial paralysis in chronic suppurative otitis media. Clin Otolaryngol Allied Sci 1989;14:515-7. 5. Siddiq MA, Hanu-Cernat LM, Irving RM. Facial palsy secondary to cholesteatoma: Analysis of outcome following surgery.J Laryngol Otol 2007;121:114-7. 6. Saito H, Takeda T, Kishimoto S. Facial nerve to facial canal crosssectional area ratio in children. Laryngoscope 1992;102:1172-6. 7. Wadell A, Maw AR. Cholesteatoma causing facial nerve transaction. J Laryngol Otol 2001;115:214-5. 8. Selesnick SH, Jackler RK. Facial paralysis in suppurative ear disease. Oper Tech Otolaryngol Head Neck Surg 1992;3:61-8. 9. Altuntas A, Unal A, Aslan A, Ozcan M, Kurkcuoglu S, Nalca Y. Facial nerve paralysis in chronic suppurative otitis media: Ankara Numune Hospital experience. Auris Nasus Larynx 1998;25:169- 72. 10. Yetiser S, Tosun F, Kazkayas M. Facial nerve paralysis due to chronic otitis media. Otol Neurotol 2002;23:580-8. 11. Jackson GC. Facial nerve paralysis; diagnosis and treatment of lower motor neuron facial nerve lesions and facial paralysis., American Academy of Otolaryngology-Head and Neck Surgery Foundation Committee on Continuing Education in Otolaryngology. Washington, 1986. 12. Dubey SP, Larawin V. Complications of chronic suppurative otitis media and their management. Laryngoscope 2007;117:264-7.